Tedrow Drive: More Than A Man. 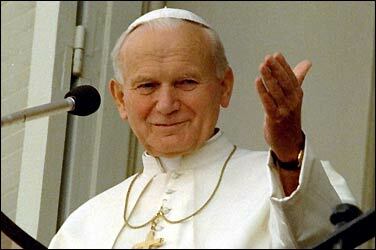 By now you know that Pope John Paul II has died in the Vatican. I'm not Catholic, but I still grieve the death of the Pontiff. An example of his magnificence: In 1983, the Pope visited a prison. Not a place you'd expect him to visit. He was there, however, to meet with Mehmet Ali Agca. Agca attempted to assassinate the Pope in 1981. The purpose of the visit was clear -- the Pope wished to forgive and bless the man that sought to kill him. How noble. How magnificent. From his energetic revival of Catholic evangelism to his stand against communism in 1979, Pope John Paul II transcended all notions of humanity. He serves as a clear example of what it means to be more than human. I'm not a Catholic, but surely this was a faithful servant of God. I will start up a new one next week. Very busy with work stuff this week. Guess Who's Got My Info? The Color and Pageantry of Bollywood.